Want to read the Bible but don't know where to start? Puzzled about how it all fits together? Be taken on a journey to get the big picture overview, move in closer - see where the different sections fit into the landscape, zoom in for a look at each Bible book, discover Jesus and God's plan of salvation at the centre. The book is divided into three main sections to give readers different levels of Bible engagement, ranging from a general overview to a close-up look at each book. 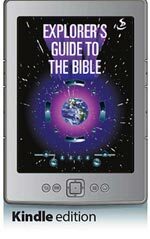 Explorer's Guide to the Bible is a great starter to use for personal exploration, or to use with church groups. Diagrams to demonstrate timescales etc.